Mises en scène d’imposants massifs de dahlias, hortensias et vivaces basées sur les perspectives et les couleurs pour la peinture. Scenery of impressive-imposing dahlias, hydrangeas, perennial flower beds based on perspectives and colours for them to be used in painting. The pond is orientated east-west in order to enjoy the early morning and sunsets lights. 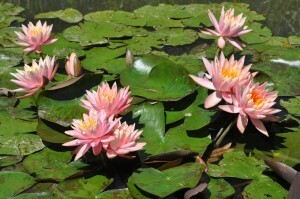 You will marvel at the waterfalls and streams with their rich varieties of water lilies, water plants and Koï carps.